Starting off in Alice: Madness Returns you are in your Orphanage type facility, speaking with your doctor and they are trying to make sense of your (Alice Liddell’s) twisted mind. On the outside she seems like a normal girl but as she goes from the ever so real Victorian London, then back to a very twisted Wonderland… a Wonderland that we have never seen before. Alice will go back and form between reality and Wonderland through different, random ways. While in Wonderland, as fans of the original may know, it is no walk in the park as Alice must fight her way through the imaginary world just to survive, let alone get out. Alice: Madness Returns is the sequel to the original game entitle American McGee’s Alice which was haled by many as a masterpiece released back on 2000. By purchasing the game you automatically gain access to the original game through an online pass code. The whole story of Alice Madness: Returns revolves around you trying to unravel the memories of your past and your parents death. In fact there are many collectables in the game like potion bottles, teeth and miniature glowing houses that are suppose to add to add lost memories. Unfortunately these collectables really don’t do all that much by attaining them all other than giving you a short audio snippet or some achievements/trophies, that is of course aside from the teeth which is used as a form of currency in Wonderland to upgrade your weaponry. Speaking of weaponry, you will eventually get a number of different items to choose from that also reflect upon the twisted world of Wonderland. With the Vorpal melee blade being the more normal of them, you will get a pepper grinder that resembles a machine gun, a tea pod that acts as a mortar, a Rabbit Bomb that can be seen as a timed remote mine, and a Hobby Horse that can be used to break through an enemy block, break through barriers or as a heavy attack once upgraded. You will also gain a handy umbrella to block attacks as well as deflect ranged enemy attacks. A new targeting system has also been put in place that is easy to use and very familiar from many other games. All the weapons are upgradeable multiple times, provided you have collected enough teeth to do so. 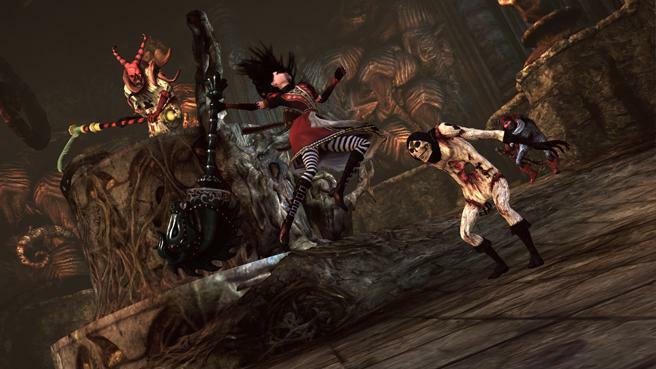 Alice: Madness Returns is essentially a 3D puzzle-platformer which has been seen before and is in no way a bad thing. You can double jump while at times it can be beneficial to let your first jump let you float through air using your dress before the next jump is attempted. There are steam vents to keep Alice afloat, mushrooms that are used to spring you in the air and of course what modern day platformer would be complete with out some moving platforms. The world of Wonderland has changed very much since the last game but in the the classic McGee style it has not lost any of the twisted touches that made the original as well as Lewis Carroll’s version so unique. You will enter a much darker Wonderland if that seems possible after playing the original. While playing the game thinking to myself how twisted this was from the original, I went even deeper down the rabbit hole even surprising myself as the story and world kept morphing into something new. Every little detail to the game was so unique and creative in that Wonderland kind of way. I almost felt as if I was in the dark side of Lewis Carroll’s mind while playing the game. 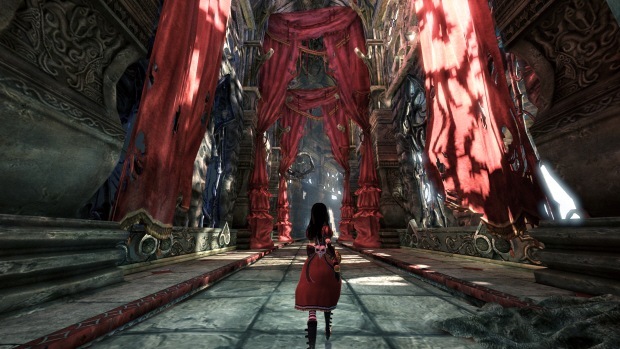 As impressive as the dark and twisted wonderland was, as you journeyed through the five different environments or stages, there were some issues with the game. The worlds are filled with detailed environments, but at times it took a moment to actually load the graphics or textures in, which really could have been appreciated more if they were pre-loaded. Sometimes you might find yourself running into invisible walls or not being able to enter an area while shrunken, which you could clearly enter if there was something beyond that point. This was not all that common, nor a huge issue but most definitely worth mentioning considering the hidden collectibles strewn across wonderland. Being able to shrink yourself on command was a delightful bit of humor as you hiccuped every so often while shrunken from drink the potion. You can also see secrets written on the walls or simply the direction you were suppose to move toward to progress, only while shrunken. Along with your shrinkage vision, I am sure you can imagine another end of the spectrum without giving too much of the story away. 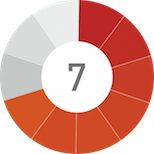 With there being only five stages, you will be spending much time in each of them. While the unique environments are enjoyable to see, they are not as enjoyable hours later. That coupled with the puzzle system can make the game seem rather repetitive until you reach that next stage. You can only turn so many switches on that will usually do something extremely obvious until you just know what’s coming next. There were a few unique puzzles and stages to get away from the normal formula used for the levels though. The cut scenes were all pretty much this paper cut-out of characters and environments moving which obviously is not the graphic quality you are used to seeing in games, but it was with out a doubt, intentionally used to add to the macabre feel of the game. Alice: Madness Returns was a fun game, especially if you have a knack for a little darkness or are just a fan of the first game. I personally due, so it was amusing to see that mixed with the developers art style, along with a classic fairytale that has its own kind of mystery to it alone. The weapons and environments truly could not have been more creative with a touch of humor. In terms of content, it really doesn’t get much better than this because even though there are only five stages, you’ll be at the game for at least 12 hours. On top of that with the original American McGee’s Alice included with every purchase you are essentially getting a whole other game. If you were a fan of the original or are just looking for something different, I would suggest you check out the game, because there is really nothing else like this on the market. The dark, creative art style is really shown through out all aspects of the game, even with a touch of humor. A fun and very unique 3D puzzle platformer. Graphics load times can be slow. Can be repetitive to a degree. Once again we go in the world of Wonderland with Alice, only this time it is darker and creepier than ever. With knife and pepper shaker in hand Alice must survive this changed Wonderland.